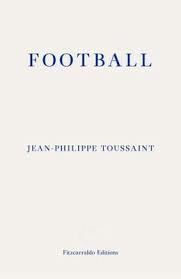 Belgian writer Jean-Phillipe Toussaint is another with a love for the game, and in his book Football (translated by Shaun Whiteside, electronic review copy courtesy of the publisher), he discusses his relationship with the sport, with the text structured loosely around the last few World Cup Finals tournaments. Starting with 1998, a memorable year for all Francophones, Toussaint blends his experiences of the tournaments with memories of younger days, looking back at games on Belgian wastelands with jumpers for goals. We then move forward in time, with Toussaint focusing heavily on the 2002 event in Japan and Korea, less on the German edition of 2006 (and hardly at all on the 2010 South Africa World Cup), ending up with a uniquely personal take on the 2014 final in Brazil, one involving a storm and an old transistor radio. Football is a short work, clocking in at 88 pages (with a few spaces scattered among them) – it’s certainly not a book that will take you a week to get through (ninety minutes, perhaps?). Toussaint takes a rather personal approach, and while there is some description of what’s happening on the pitch, for the most part the actual football is implicit. Those without the encyclopaedic knowledge of the World Cup that some people (like me…) have may not even notice the allusions at all. This is particularly true in the first section, with its mini-essays and musings on topics such as stadiums, childhood, seasons and the trophy. This vision of a blue tide sweeping through the busy streets of the capital contrasts with more traditional views of the Kamo river in Kyoto, reminding me of my own time in the country (I left Japan in May 2002, shortly before the World Cup – my application for tickets was unsuccessful…). At the end of the book, there’s a bonus piece, an earlier essay titled ‘Zidane’s Melancholy’. It’s a whimsical, wistful take on that night in 2006 when the best player in the world temporarily lost his head – and put it where it didn’t belong. It’s an interesting take on the event, and while I don’t agree with the writer’s views completely, it’s a nice way to round the book off. Forgive me if I doubt that a little… Toussaint is obviously a fan (albeit no Nick Hornby), but the book falls between two stools. In his foreword, he jokes that neither intellectuals nor football fans will like the book; I’m both (sort of), and it never really satisfies me. Even the Zidane piece is not quite right, with its idea of Zidane knowing he is fated to lose, unable to alter this fate – which is not how I saw it (the best player on the pitch was racially taunted by a sleazy opponent until he snapped…). And perhaps this is the way we need to read it, ignoring the rather coincidental guiding thread of football and concentrating on what the book says about the writer, even if that can be a little disappointing for those who actually want to read about the sporting side of life. The writing is excellent, and Whiteside has managed to produce a text which is clear and flowing and doesn’t pander too much to a global audience (although I’d have preferred him to talk about ‘shirts’ rather than ‘jerseys’…).